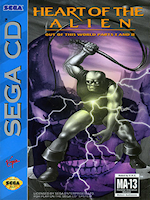 My work on Heart of the Alien came by accident, for Virgin Games was thinking about porting this well-established game over to the Sega CD platform, so I was given it to evaluate. While it was an awesome game I felt it was way too short of a game to port to the new CD platform. My boss at the time asked me to prove the game was too short, but seeing the games designers didn’t create any design documents this would become difficult. So after videoing the game from start to finish, I went on to reverse design the game. After displaying the whole game on my office wall my point was made and the developers were brought out to California to meet with me and take my designs back with them to expand on the game.